Choosing material for a trimming job is interesting given there are too many choices in materials, colour and texture. After much debate, walking outside to check out the colour in natural light and looking at it through the glass we decided on a couple of different shades of grey leather. The door cards and the seat surrounds will be covered in light grey leather called Pearla and the inserts will feature darker grey perforated suede. The suede will stop me sliding around on the seat and won’t be hot on the bum in summer. 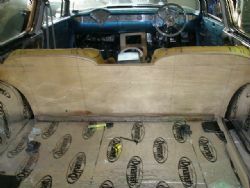 A matching carpet is yet to be decided on but we have discussed the overall layout and to stop me trashing the door trim the bottom section will also feature carpet. 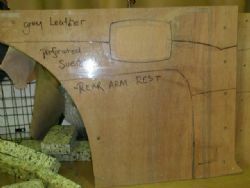 The original 57 door armrests were dated, ugly and short so we needed to come up with a solution for an update. After researching the options we sourced some from the US that will give the desired look and be practical as well. The overall mantra behind the interior is comfort first, appearance second and last but not least simplicity. That’s the theory anyway. Duncan suggested we jettison the old rear seat, carry the console through to the rear and install bucket seats in the back. After much debate and trial fitting one of the front cut down seats in the rear it looked like a good idea. The original rear seat is not much better than a park bench so the idea of raising the comfort bar for passengers was appealing. Another pair of Commodore buckets were sourced, chopped and refined for the rear. The centre console that I initially started then outsourced to Strathfield Car Radio to complete will be massaged and extended to accommodate the new ideas. The rear seat will obviously not fold down like it was from the factory but the likelihood of me carting stuff in the back is slim and once it is finished it will compliment the overall look of the interior. 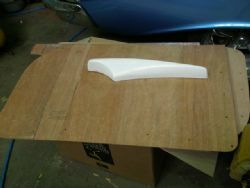 When I arrived this morning the door cards had been fabricated from ply and the rear seats had been mocked mounted. This gave me the opportunity to sit in them and see how the legroom was and discuss plenty of other details. 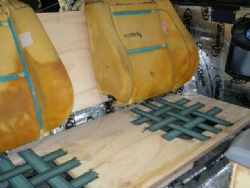 The rear seatbelts will be reworked to take a horizontal feed eliminating the need to have them hanging off the roof, which would have looked ordinary. The suede I had chosen has been discontinued so we are getting the new samples to see what will work. So far, so good. Watch this space….